With so many tools and software available at our disposal, designers can get away scot-free without knowing how the RGB color model works. There’s no need to calculate a color’s RGB value, or be able to read RGB color values, because Photoshop will do it for us. But it never hurts to learn the fundamentals. 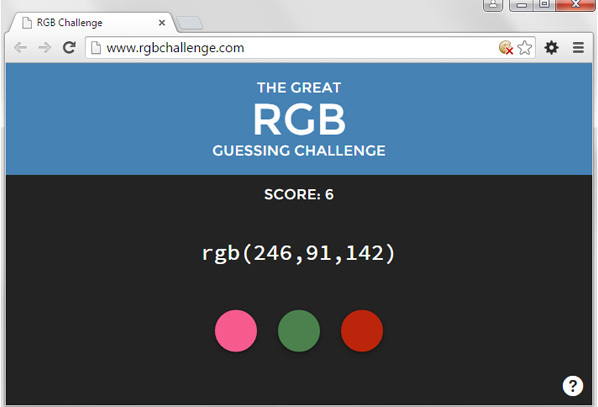 If you want to practice your RGB color identification skills, head over to the online game called RGB Challenge. The game is true to its name. This game is definitely a challenge. The RGB color values you’re tasked to identify aren’t simple colors like rgb(255 , 0, 0) (i.e. red) or rgb(0, 0, 0) (i.e. black), it will be colors such as rgb(206, 61, 61) which — I think, I’m not really sure — is a sort of muted pink. If you’re interested in other RGB color identification games, check out Hex Invaders as well, which is a bit more suited for beginners, and has a nice explainer on how the RGB color model works. If you’re a CSS developer, check out my tutorial on CSS RGBA Colors over at Six Revisions.